A Vegas Girl at Heart: Preparing for December Daily - Stampin' Up! Preparing for December Daily - Stampin' Up! 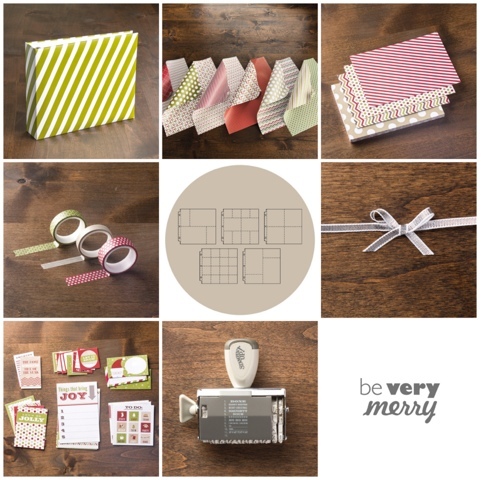 Lots of talk all over the scrappy forums of December Daily kits. If you haven't heard of December Daily, check out Ali Edwards' blog and read up. Last year I incorporated a form of December Daily into my Project Life album. I purchased Ali's 3x4 journaling cards and her overlays and added one photo a day to my album. This year the idea of a Christmas season album is appealing. However I hate the idea of buying a kit for a high price tag. I thought about making a kit from my stash, and was all set to do so until I had to place my quarterly Stampin' Up! demonstrator order. I was struggling to find enough items I wanted this time to make my minimum, and when I saw the holiday catalog's Season of Style suite I solved two problems at once. Here's what I ordered for my December Daily kit. I will probably add solid card stock and some embellishments from my own stash as well. I also will order some WRMK full page 8x8 page protectors from Amazon with a gift card I have. Here's the list of supplies, with links, and cost (the cost is based on having a demo-use the demonstrator search tool to find one if you don't have one). I get a 20% demonstrator discount so my total with tax and shipping came to about $63. I had to spend the money anyway to make my quarterly minimum so it worked out perfectly for me. I listed each item out because if you were interested, you could add or remove certain items based on what you like. For example if you aren't a stamper, take out the stamp(s). Or if you don't think you'd use the 12x12 paper or the smaller paper pad, remove one of those. Anyway, just wanted to share my December Daily prep and show you another option for album supplies! Thank you Melissa, looks great. I was very enthusiastic when I read about the Studio Calico kit but when I checked it I almost fell of my chair when I saw the price! I wasn't prepared to spend a $100 just for a Christmas album! No matter how cute it is. I didn't think it was worth it.now I'm doing this for the first time so maybe this is a very normal price but not something I could justify. I'll do a 8x8 hybrid album and buy a few things and print some put from Christmas stock that I have to make a nice coherent theme. I love the color that you listed, cute album! Thanks for the listing, I'm hopping over there to check a few things out. Stupid error i my comment. I have been thinking about it all day. English is not my native language and sometimes I tend to mix words up that almost sound the same. Haha! I didn't even catch it. You're so cute! I got this kit too (although I won part of it at convention - yay!) I too am excited to use it for December Daily. I've struggled to complete a DD album in the past because I took on too much with making pages every day. With this - since it's Project-Life like and it's just dropping things in the pockets, I think I can do it. Can't wait to see what you do!